You always hear from groups promoting false cures “listen to the parents”. Well parents, like me, see MMS (Miracle Mineral Solution) aka CD (Chlorine Dioxide) as abusive. There is no evidence that it works. There is no good explanation for why it should work as a therapy. And there is the chance of adverse reactions. No benefit and a risk. Risk/reward ratio is 0. 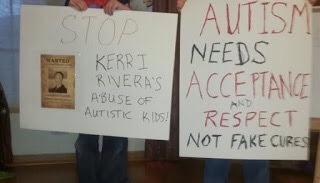 ← Illinois to Kerri Rivera: Show that MMS works or stop making claims.